A few bad layout decisions rhis model . Of all the portable keyboards I’ve tested or attempted to use over the years, I loathe the iWerkz Universal Folding Keyboard the most. If you’re shopping for a coworker, writer, or student you despise, this is the accessory to get. That said, there’s a ton of people that seem to LOVE it—I chose to call it in for testing after seeing that 50% of the 700-plus people who reviewed it on Amazon gave it a five-star rating. I even ran its Amazon page through FakeSpot. The service told me that the reviews for the iWerkz were legit. FakeSpot couldn’t tell me, however, how many of the reviewers are masochists. 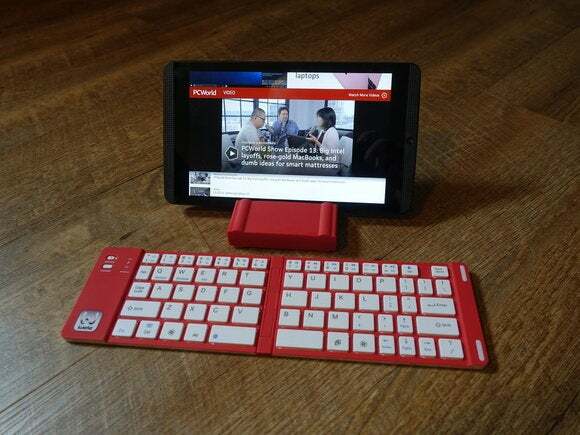 As with the other folding keyboards profiled in this roundup, the iWerkz connects to devices via Bluetooth. 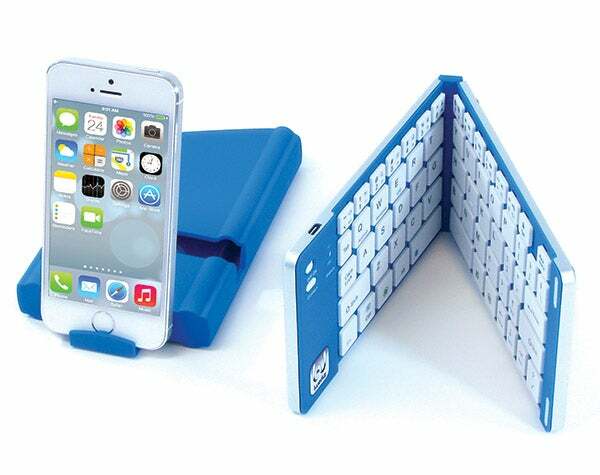 Though the documentation is a bit thin, the keyboard is compatible with hardware running Android, iOS, or Windows. The iWerkz measures 5.87 x 3.5 x 0.88 inches closed. Pivoting at a single hinge in the middle of the keyboard, its dimensions change to 11.5 x 3.5 x 0.25 inches once deployed. Were all that space used as typing real estate, the iWerkz would be pretty close to going blow-to-blow with a full-sized laptop keyboard. Instead, the iWerkz’s designers wasted close to two inches of the keyboard’s length with a large, inch-wide rectangle of plastic that contains the keyboard’s battery pack, on/off switch, Bluetooth pairing button, and status lights. 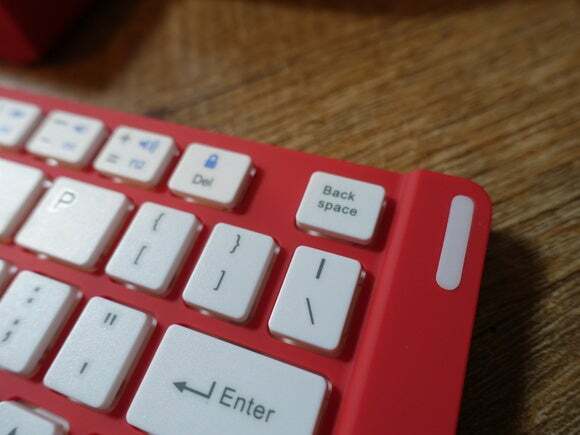 The keyboard’s wide central hinge and plastic buffer on the other side of the keyboard eat up the rest of what could have been viable keyboard space. The iWerkz’s typing experience is hampered by keys that are smaller, with narrower spacing between them, than on a full-sized keyboard. To make matters worse, especially for touch-typers, that hinge in the middle of the keyboard creates a half-inch gap right down the middle of the keys. Touch-typing was difficult on the Jorno, ZAGG, and EC Tech keyboards, but it proved just about impossible with the iWerkz hardware. This issue is compounded by the fact that a number of keys on both sides of the hinge—the T, H and V—are longer than any of the other letter keys on the keyboard. The hinge also splits the spacebar in half. On a number of occasions during testing, I found that I’d slap the hinge with my thumb instead of creating a space between words. While hunting-and-pecking to eke out a few sentences, my typing speed slowed to a crawl. Even then, I found myself having to go back and correct typos. Now, let’s talk about the Backspace/Delete key. The key stands about 0.75 inch in length and roughly 0.5 inch tall. With other keyboards, I’d call these dimensions an unfortunate design choice. Someone failed to account for how important the Backspace key is in word processing. Mistakes happen. 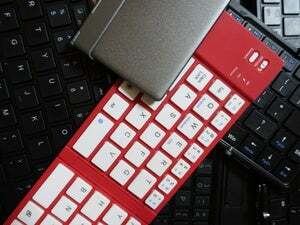 The iWerkz keyboard goes beyond forgetful design, however. About a half-inch of unused space sits directly to the left of the key. The company could have made the Backspace key larger, but it chose not to. With all of this in mind, it seems irrelevant for me to note that the travel and response of the keys actually feels pretty good. Too bad that everything else about the typing experience is so crummy. 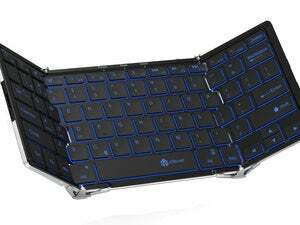 After searching my soul, hard, I feel there’s only a couple of good things I can say about the iWerkz Universal Folding Keyboard with a straight face. First, its hard plastic sleeve, which is made from low-quality plastic, can be slid off and used as a stand for your tablet or smartphone. It even offers a few different viewing angles when serving as a stand. Second, the price tag on this is only $30 (and I say “only” loosely). You can get a Jorno knock-off with a much better experience for just a few dollars more, but at least something so terrible isn’t flat-out expensive. It's hard to believe that other folks love iWerkz's Universal Folding keyboard, because the experience of typing on it is abysmal.